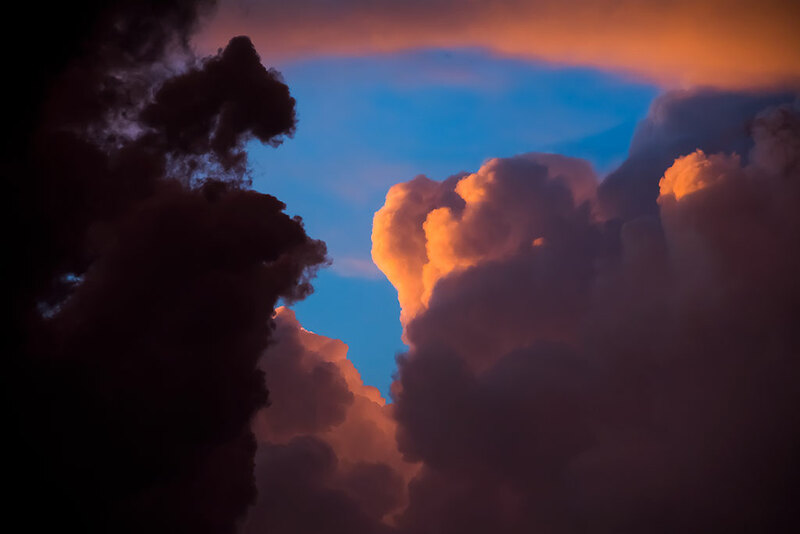 As the sun set, we found ourselves between two thunderstorms, and I made this colorful image. Our Sunday started with this rather dire forecast map, that turned out to be right on the money. 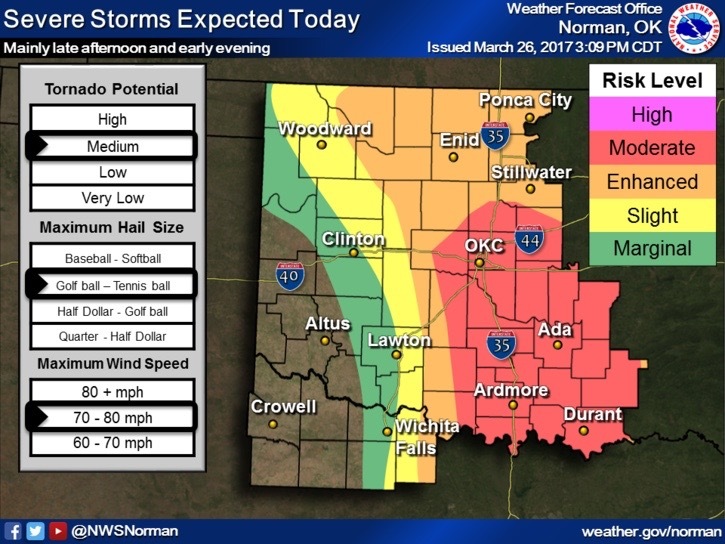 We live in Ada, which is at the center of the red zone. Obviously, there is weather everywhere on earth at all times, but this question is very Oklahomacentric. It asks if the forecast calls for severe weather – thunderstorms and possibly tornadoes. Last night we had our first round of “weather,” and it was exciting without being tragic. We had tornado watches and severe thunderstorm warnings, and a tornado warning right here in our county. 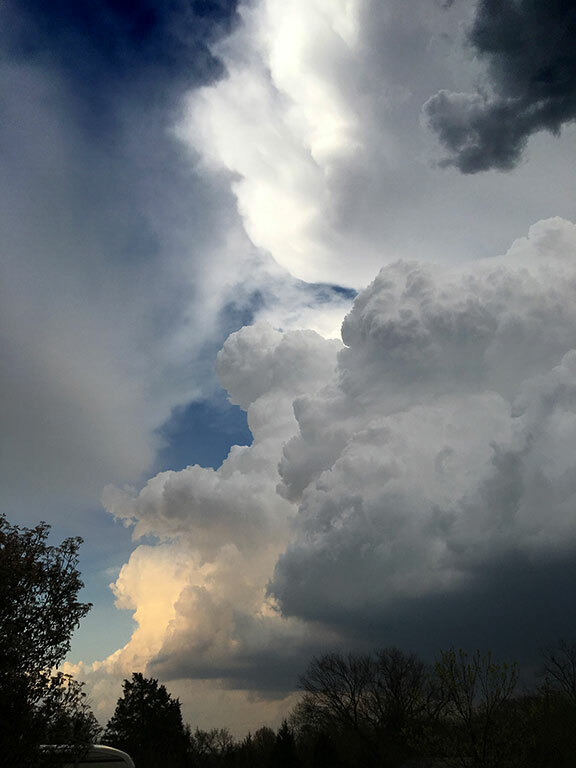 This is the back side of the storm that produced the tornado warning and a small, intermittent funnel south of Ada in the community of Ahloso. Abby and I were surprised and annoyed that our cable television service was taken over by the Weather Service, interrupting the coverage of the weather to give us a text message of the warning. Our phones also sent us noisy messages. None of that mattered – we were already listening to all the right public safety frequencies and were hearing their reports in real time. I didn’t see or photography any tornados, though a coworker did. 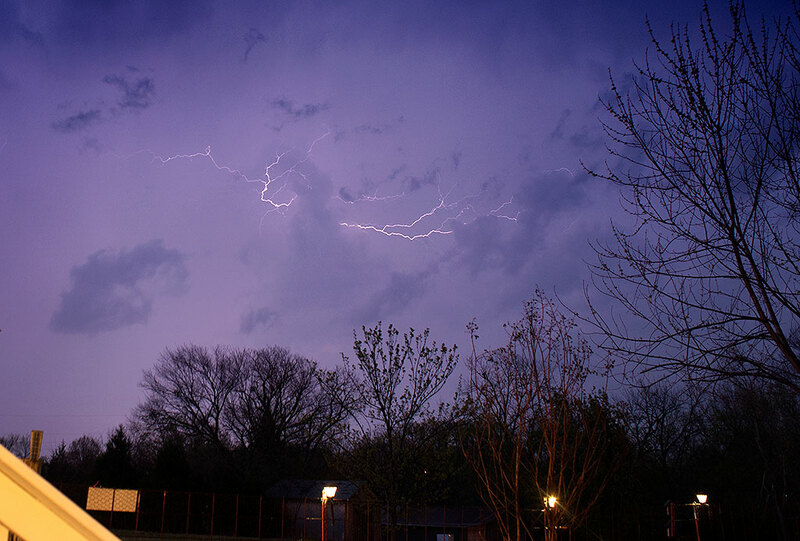 My attempts to photograph lightning fell flat – it’s never easy, and last night the sky wasn’t cooperating. This was the best I could muster for lighting last night. And your lightning photo was a sigh of relief for me — I’ve tried a dozen times since moving into this house, and my best was not worth keeping. It made me feel better to hear (read) you say how difficult it can be . We “had weather” on Saturday. Sudden hail found Mr. Hammill and I racing out the front door with giant sheets of core-plast to drape over the new vehicle. It worked, but man, it was like taking the “ice bucket challenge” over and over again. I am reminded of Michaelangelo clouds.